IoT device Developed by ourselves,combined with Bluetooth module,GSM,GPS and Sim card solt,it was fixed inside the foot pedal. We are souce factory. Our products take the lead with high quality and competitive price in the peer. Because specialty, so do better! Normally for batch order, we recommend ship by sea, we can cooperate with your freight forwarder, or we can arrange shipping. You can inform us your destination port first, then we will check the shipping costs. 1. The controller, battery of the FitriderT2 are also IP67? The waterproof grade of the battery is IP67, while the waterproofing grade of controller is not IP67 yet.But we can make it for you.There is no problem that the current T2 is put on the street to undergo rainstorm baptism, but it can not be soaked in water. 2. Could it be foldable only for shipping purposes but not foldable once we assemble? Yes,we can do it for you.We can add a mechanism for you to make it impossible for the users to fold the electric scooter. When your staff needs to replace the battery, your staff can fold the scooter. 3.Is the GSM module 4Gor 3G?Do you have oceania and americas option available? The GSM module is 4G.Our communication modules can be used in most countries in the world. Different countries need to customize different communication modules. 4. What server do you use? Do you offer connection guarantee? We use MQTT protocol,so you should build a MQTT server. We can offer the connection guarantee. 5.Do you have anti-theft function? We can provide you with anti-theft alarm. 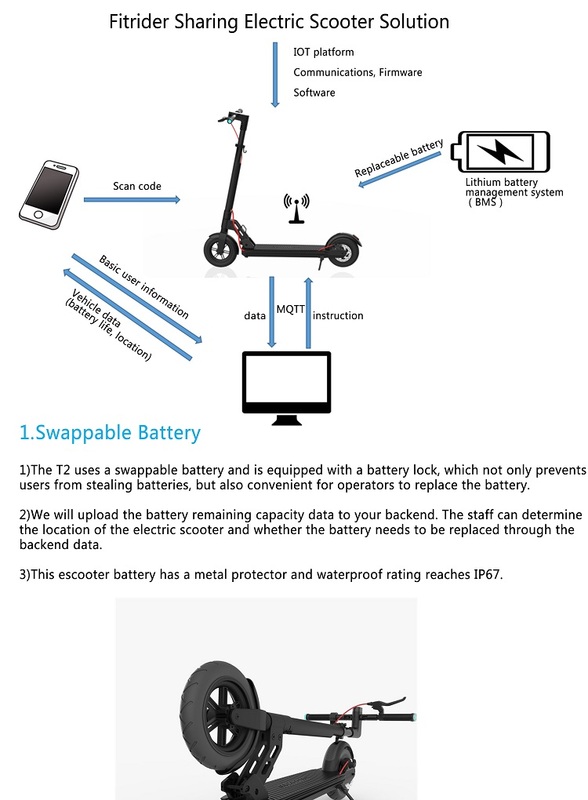 When the electric scooter is moved or vibrated in the off state, the electronic lock will generate resistance to the motor, the lock will lock the motor, and the electric scooter will sound an alarm and upload the current position data to the server background. 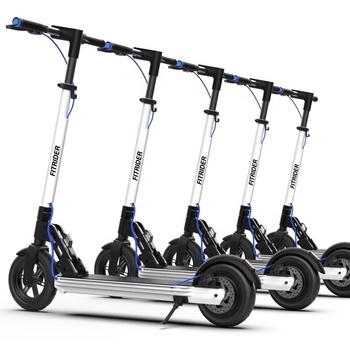 6.What data can we get from the scooter? We can provide single riding time, total riding time, single riding distance, total riding distance, current speed, real-time positioning, fault code, speed limit, controller temperature, remaining ride mileage, battery capacity etc. 7. Why do you use a Bluetooth Module? 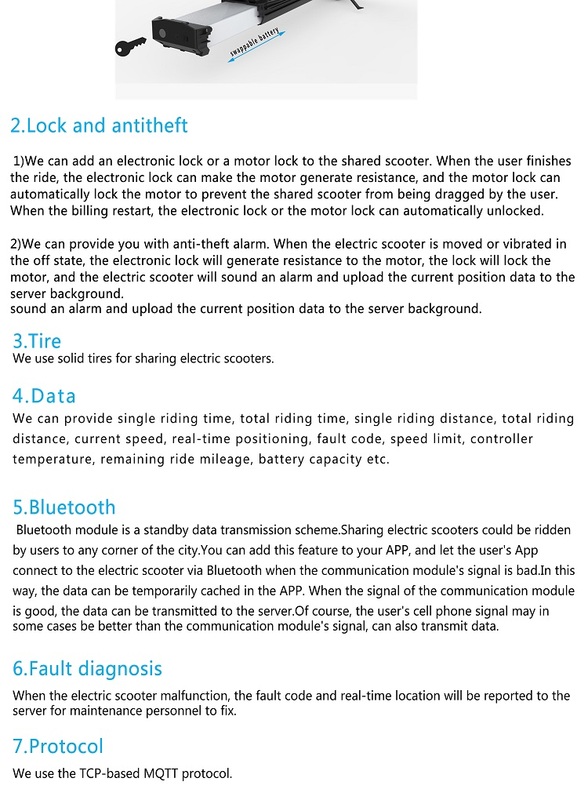 Bluetooth module is a backup data transmission scheme.Sharing electric scooters could be ridden by users to any corner of the city.You can add this feature to your APP, and let the user's App connect to the electric scooter via Bluetooth when the communication module's signal is bad.In this way, the data can be temporarily collected in the APP. When the signal of the communication module is good, the data can be transmitted to the server. Of course, the user's cell phone signal may in some cases be better than the communication module's signal, can also transmit data. 8. How does it work when we you need to update the firmware? 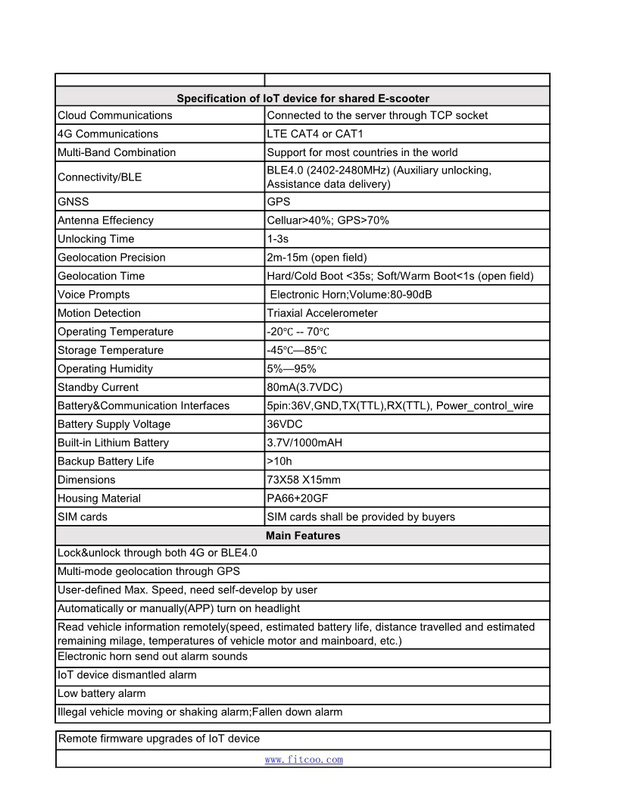 Our IoT device support OTA capabilities.When you need to update the firmware,we can provide the protocol to update the firmware.You can update the firmware remotely. 9. Do you offer spare parts with the purchase? How many? We provide spare parts that worth 1% of the total ordered value for free. 10. What is your payment terms?